Wargame and Game reviews: ROC: the game of the Albigensis Croisade (publisher: SARL Selene) Ciudadelas (Edge Entertainment) Age of Mitology (Edge Entertainment) Computer Games: Pacific Fighters (Ubisoft) Side Meier's Pirates (Piraxis Games) Book News. Historical articles: The Empire Where the Sun Never Sets,The Generals of the Spanish Royalist Army of the Wars of South American Independence, the Spanish Army during the Independence War, 1808-1815. 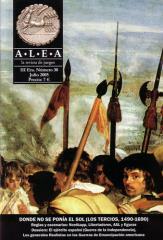 Basic Bibliography: The Spanish Tercios. Four Battles of the Spanish Tercios, by Enric Martí and Cándido González. Otumba 8 July 1520, Spaniards vs. Aztecs St. Quentin, 10 August 1557 Spanish vs. French Tunis, 20 July 1535 Spanish and Empire vs. Turkish and pirates Nieuport, 2 July 1600 Spanish vs. Dutch. Solitaire rules for Nordkapp 1942, by Paul Rohrbaugh and Javier Romero. Three more scenarios and additional rules for Nordkapp 1942, by Javier Romero: "Arctic Victory" Convoy PQ-18, September 1942 "To the Sound of the Guns" The Battle of Barents Sea, December 1942 "Admiralty Appreciates Scharnhorst is at Sea" The Battle of North Cape, December 1943. Two more battles for the Libertadores system, by Enric Martí: Pichincha (April 1822) and Tucumán (September 1812). Spanish Civil War ASL scenario with some extra counters, complete with Kondratyev' BT-5 tanks: Operation Moscú, the Republican offensive on to Fuentes de Ebro, October 1937 Miniatures scenarios: Medellín, 28 March 1809 (Napoleonic) Montaña Blanca, 8 November 1620 (30 Years War), and Stalingrad RR station, October 1942 (WW 2).